Hi guys! I hope you all had a fun weekend and a good Father’s Day! We were super busy and had so much fun. The weather has been so nice and we’ve spent more time outside than inside. I love this time of the year and with being so busy it’s easy to forget to do the little things for yourself like masking. I set reminders to do things like face mask, exfoliate, fake tan, etc. My favorite drugstore masks have been the Formula 10.0.6 line for so long because they are so effective and have good ingredients. 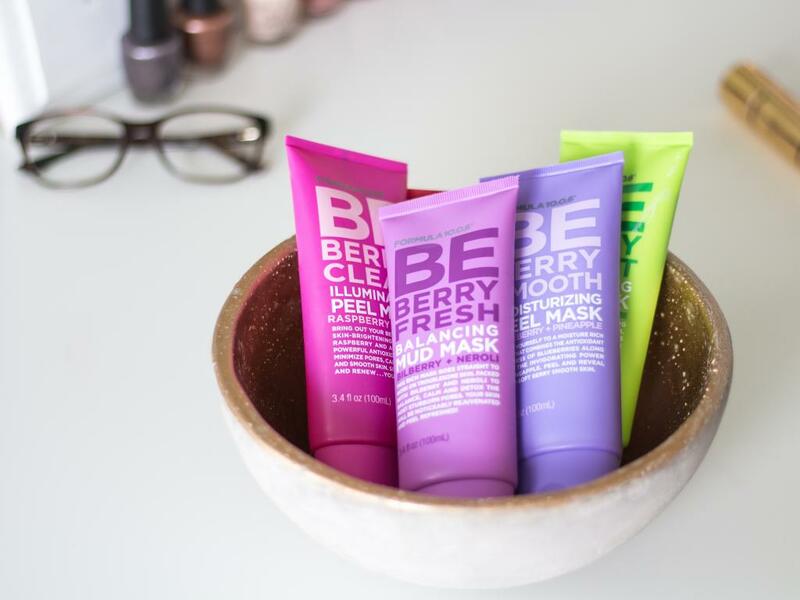 They’re also super affordable and they just came out with a new line of masks and cleansers full of berries and antioxidants. If you know me you know I love antioxidants in my skincare because they protect you from the environment like pollution and things like that. I’m super excited about this line so I’m sharing what I’ve been using from it, there are 3 peel off masks, 2 mud masks, a cleanser and a scrub. PS they all smell amazing as you can imagine. The peel masks are a gel formula that you apply in a thin layer, let dry, and then peel off. This one has pomegranate and yumberry to help boost circulation and energize the skin. This is an illuminating peel mask with raspberry and acai to renew and calm skin while also minimizing pores. This moisturizing peel mask has blueberry and pineapple to hydrate and invigorate your skin. It has a strong pineapple scent so not for those sensitive to smells. This mud mask is an exfoliating one which I love. The goji berry in it is a powerful antioxidant and the green coffee gently scrubs away dry and dull skin. This is a balancing mud mask with bilberry to hydrate/rejuvenate your skin and neroli which is an antioxidant and also detoxifies skin. I love the Formula 10.0.6 cleansers because they are so good and so inexpensive! This one has blackberry which hydrates and detoxifies and coconut milk to soothe and hydrate. This cleanser smells good enough to eat and leaves my skin clean and smooth. Lastly this line has an exfoliating face scrub. It has cranberry, bamboo and shea butter to exfoliate your skin and leave it smooth and glowy. My husband loves this one too. Use a scrub at least once a week to get rid of dead skin/dirt/grime. Multimask: Use 2-3 masks a once to target different skincare concerns. For example a detoxing mask in your t-zone or where you have large pores and an illuminating mask where you have dull skin. Host a spa night with your friends to mask and pamper, with rosé of course. Thank you for reading today! What are your favorite affordable face masks? Have you tried Formula 10.0.6? What did you think? Thanks to Formula 10.0.6 for collaborating with me on this post. I have a slight obsession with face masks, I will definitely be checking this out! Thanks for sharing Torey!! Really? Use a mask 2/3 times a week?! I only mask once a week and then exfoliate twice a week am I doing it wrong ?? I love doing DIY masks too!